When I woke up this morning I really felt the festive mood. The news was covering the Canada Day celebration at Ottawa and cars outside had Canadian flags attached to them. 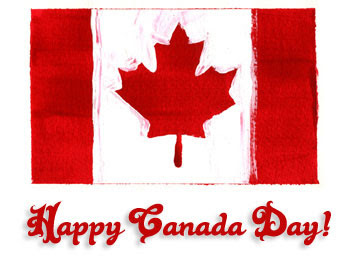 Today was in fact Canada Day, the birthday of Canada. Although I'm not a Canadian citizen yet, with emphasis on the yet, I still feel happy and proud of being able to have the privilege of living here in Canada as a Permanent Resident. I am one of the 90% of people living here in Canada that said that Canada is a great place to live. Canada is a place of diverse culture and nationalities and for my family, it is the place where our dreams came true (well partly since I'm not yet in school and being able to finish my nursing program is one of my goals). Equality and great opportunities are the reason my mom wanted to move here in Canada, not to mention the great economy (then and in the coming future I hope) and good governance. We had our own little celebrations here in our neighbourhood where people all gathered together at the park to see the beautiful fireworks display. I was unfortunately working today but I still had the opportunity to stop whatever I was doing and go outside to appreciate the fireworks.